175 BLAEU, G. Magnae Britanniae et Hiberniae Tabula. Amsterdam, 1635. Beau col. en partie original. Belle impression, bien contrast�e. 385 x 493 mm. 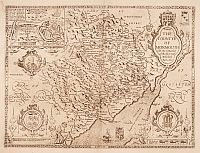 � A finely engraved map from the most important Dutch map publishers of the 17th century. 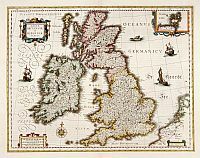 The plate was acquired by the Blaeu's from Jodocus Hondius Jr. in 1629, and was re-issued as the standard map of the British Isles in their atlases. 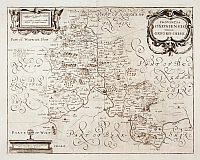 176 SANSON, N. / JAILLOT, H. Les Isles Britanniques qui contiennent les royaumes d'Angleterre, Escosse, et Irlande� Paris, 1709. Limites en col. d'�poque. Bel exemplaire. Cartouche et carte col. 456 x 647 mm. � Grav� par Cordier. - Inset map with Orcades, Shetland and Fero islands. 179 OVERTON, J. & H. The countye of MONMOUTH with the situation of the shire tow� Described Ann. 1610. Londres, 1710-1743. Mouillures marginales. Bel exemplaire bien contrast�. - Verso blank. Wide margins, with manuscript title on verso. 380 x 505 mm. � Rare. From the Johan and Henry Overton's edition of John Speeds "Theatre of the Empire of Great Britain". Apart from 4 editions of the Atlas, published between the years c. 1710 and 1743 (all extremely rare), Henry Overton also issued Speed's maps in other composite atlases. (cf Bannister). With an inset plan of Monmouth. 180 SPEED, J./ OVERTON, J. 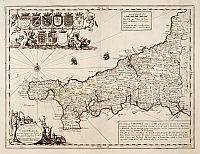 & H. A new mapp of the county of Cornwall� Londres, 1710-1743. Bel exemplaire bien contrast�. - Verso blanc. Wide margins, with manuscript title on verso. 371 x 490 mm. � Rare. From the Johan and Henry Overton's edition of John Speeds "Theatre of the Empire of Great Britain". Apart from 4 editions of the Atlas, published between the years c. 1710 and 1743 (all extremely rare), Henry Overton also issued Speed's maps in other composite atlases. (cf Bannister). With a very decorative title cartouche and 9 coats of arms. 181 SPEED, J./ OVERTON, J. & H. Cambridgshire� Londres, 1710-1743. Mouillures marginales, fente en haut du pli central. Bel exemplaire bien contrast�. - Verso blank. Wide margins, with manuscript title on verso. 380 x 515 mm. � Rare. From the Johan and Henry Overton's edition of John Speeds "Theatre of the Empire of Great Britain". Apart from 4 editions of the Atlas, published between the years c. 1710 and 1743 (all extremely rare), Henry Overton also issued Speed's maps in other composite atlases. (cf Bannister). Double-page engraved map, inset plan of Cambridge, scale bar within a pair of compasses, elaborate side borders with the arms of the colleges, lower border with seven family coats of arms. 182 SPEED, J./ OVERTON, J. & H. Provincia Oxoniensis/ Oxford-Shire. Londres, 1710-1743. Bel exemplaire bien contrast�. - Verso blank. Wide margins, with manuscript title on verso. 368 x 462 mm. � Rare. From the Johan and Henry Overton's edition of John Speeds "Theatre of the Empire of Great Britain". Apart from 4 editions of the Atlas, published between the years c. 1710 and 1743 (all extremely rare), Henry Overton also issued Speed's maps in other composite atlases. 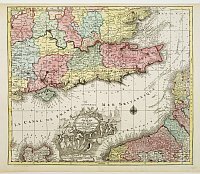 183 LOTTER, T. C. La plus grande partie de la Manche, qui contient les C�tes d'Angleterre... Augsbourg, 1770. Beau col. ancien. Bel exemplaire. - In mint condition. 500 x 580 mm. � Beau cartouche d�coratif. T.C. Lotter married M. Seutter's daughter in 1740 and succeeded him in 1756. Lotter used the copperplate of Seutter; he only changed the name. 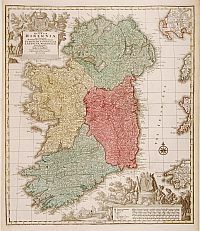 184 BLAEU, G. Hibernia regnum vulgo Ireland. Amsterdam, 1635. Beau col. en partie original. Fente en bas du pli central habilement restaur�e. Belle impression, bien contrast�e. 380 x 491 mm. 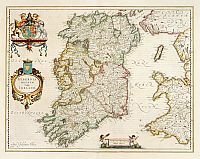 � Standard map of Ireland embellished with decorative coat of arms, cartouche with title and a scale cartouche showing two putti. 185 NOLIN, J-B. Le Royaume d'Irlande.. Paris, 1690. Limites en col. ancien. - Light overall water staining, underlaid with paper, right hand margin frayed. 600 x 463 mm. Uncommon map of Ireland. 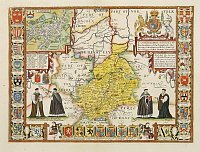 A visually stunning map with a large title cartouche. This large one-sheet map was produced by the Venetian cosmographer Vincenzo Coronelli when he was working in Paris in the 1680's. Tillemon, who corrected and amended the map was, Coronelli's collaborator in Paris and J.B.Nolin was their publisher. Nolin must have published this map separately on several occasions as it is not regularly found in atlas form. 186 LOTTER, T. C. Regnum Hiberniae. Augsbourg, 1770. Beau col. ancien. Bel exemplaire. - In mint condition. 580 x 495 mm. � 2 decorative cartouches. T.C. Lotter married M. Seutter's daughter in 1740 and succeeded him in 1756. Lotter used the copperplate of Seutter; he only changed the name. 189 CARRINGTON, F. A. A map of Scotland Divided in Counties shewing The Principal Roads Railways, Rivers, Canals, Lochs, Mountains, Islands. Londres, 1855. Col. ancien. Carte entoil�e et pli�e. Orn�e d'une vue de Melrose Abbey. Qques taches et salissures; qques manques en bordure de carte. 1880 x 1280 mm. Engraved by I. Dower. Carte monumentale et spectaculaire de l'Ecosse. Cachet du "D�p�t de la Guerre" avec la mention "Rebut" (Autorisation de libre circulation). 190 DANET, P. Plan de la ville de Londres et de Westminster� Paris, 1727. Bel exemplaire bien contrast�. L�g�rement empoussi�r�. 470 x 630 mm. � By G. Danet, son-in-law and part successor of N. de Fer. Insets in upper left right corner with descriptions in French of London and its principal buildings. View of "Monument" inset bottom left, view of "Bow Church" inset bottom right. Compass rose bottom right. With key in bottom of the map, names in French except for "Dog Row".